This will be me every drop back. My spoon probably won't have jello on it though. This will be me at Church. 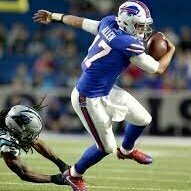 I am going to apologize upfront Lord, I will have Josh Allen on my mind during the sermon. I don't have any gifs, but try to imagine how you'd feel if you were waiting for a blind date to arrive at the restaurant when two women suddenly walked through the door and looked in your direction at the same time - one is hot as hell and the other looks like she'll eat you if her dessert doesn't arrive on time.